A solar cell is a device that converts the energy of sunlight directly into electricity by the photovoltaic effect. The term solar cell is reserved for devices designed specifically to capture energy from sunlight while the term photovoltaic cell is used when the light source is unspecified. Assemblies of cells are used to make solar modules, also known as solar panels. The energy generated this from solar modules, referred to as solar power, is an example of solar energy. Photovoltaics is the field of technology and research related to the practical application of photovoltaic cells in producing electricity from light, though it is often used specifically to refer to the generation of electricity from sunlight. Solar cells are often electrically connected and encapsulated as a module. Photovoltaic modules often have a sheet of glass on the front (sun up) side, allowing light to pass while protecting the semiconductor wafers from the elements (rain, hail, etc.). Solar cells are also usually connected in series in modules, creating an additive voltage. Connecting cells in parallel will yield a higher current. Modules are then interconnected, in series or parallel, or both, to create an array with the desired peak DC voltage and current. The power output of a solar array is measured in watts or kilowatts. In order to calculate the typical energy needs of the application, a measurement in watt-hours, kilowatt-hours or kilowatt-hours per day is often used. A common rule of thumb is that average power is equal to 20% of peak power, so that each peak kilowatt of solar array output power corresponds to energy production of 4.8 kWh per day (24 hours x 1 kW x 20% = 4.8 kWh). In the case of the original Grätzel design, the cell has 3 primary parts. On top is a transparent anode made of fluoride-doped tin dioxide (SnO2:F) deposited on the back of a (typically glass) plate. On the back of this conductive plate is a thin layer of titanium dioxide (TiO2), which forms into a highly porous structure with an extremely high surface area. TiO2 only absorbs a small fraction of the solar photons (those in the UV). The plate is then immersed in a mixture of a photosensitive ruthenium-polypyridine dye (also called molecular sensitizers) and a solvent. After soaking the film in the dye solution, a thin layer of the dye is left covalently bonded to the surface of the TiO2. A separate plate is then made with a thin layer of the iodide electrolyte spread over a conductive sheet, typically platinum metal. The two plates are then joined and sealed together to prevent the electrolyte from leaking. The construction is simple enough that there are hobby kits available to hand-construct them. Although they use a number of "advanced" materials, these are inexpensive compared to the silicon needed for normal cells because they require no expensive manufacturing steps. TiO2, for instance, is already widely used as a paint base. 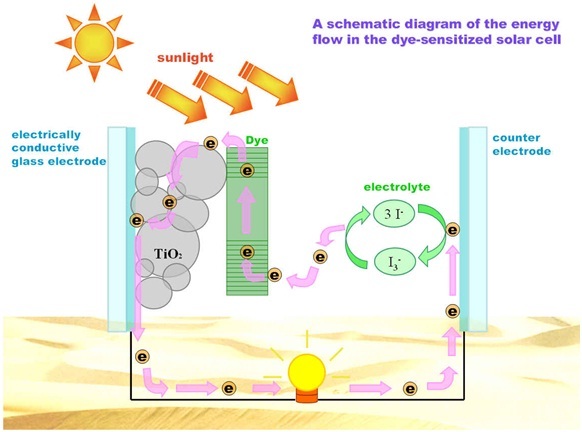 Grätzel’s cell is composed of a porous layer of titanium dioxide nano-particles, covered with a molecular dye that absorbs sunlight, like the chlorophyll in green leaves. The titanium dioxide is immersed under an electrolyte solution, above which is a platinum-based catalyst. As in a conventional alkaline battery, an anode (the titanium dioxide) and a cathode (the platinum) are placed on either side of a liquid conductor (the electrolyte). Sunlight passes through the transparent electrode into the dye layer where it can excite electrons that then flow into the titanium dioxide. The electrons flow toward the transparent electrode where they are collected for powering a load. After flowing through the external circuit, they are re-introduced into the cell on a metal electrode on the back, flowing into the electrolyte. The electrolyte then transports the electrons back to the dye molecules.